4 Bedroom Detached House For Sale in Manchester for Offers Over £295,000. Entwistle Green are delighted to bring to the market this well presented four bedroom detached family home in a quiet cul-de-sac location. The property comprises of entrance hallway, storage cupboard, guest WC, open lounge with double doors leading to the conservatory, dining room and modern kitchen through to a utility room. To the first floor are four bedrooms, the master benefitting from an en-suite shower room and a further family bathroom. 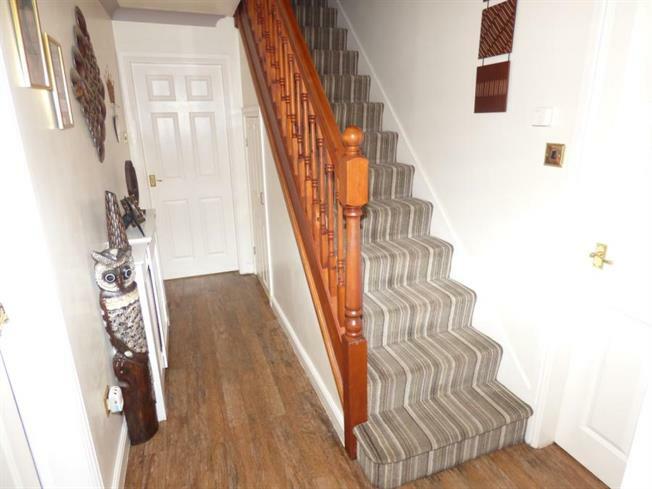 Externally the property offers a low maintenance garden to the front and private rear garden which is not overlooked, imprinted concrete driveway for multiple vehicles, 32 foot long detached garage and UPVC fascias with spotlights. Further benefits include gas central heating, double glazing, Karndean flooring to the ground floor and fitted wardrobes to three bedrooms. Karndean flooring, understair storage cupboard. UPVC double glazed window, Karndean flooring, fitted wall and base units with LED spotlights and complementary work surfaces, stainless steel sink with drainer, integrated gas hob and oven with extractor fan, access to utility room. UPVC window and door leading to the rear garden, plumbing for washing machine and dishwasher. UPVC double glazed window WC, pedestal sink, corner shower. UPVC double glazed window WC, pedestal sink, panelled bath, heated towel rail.